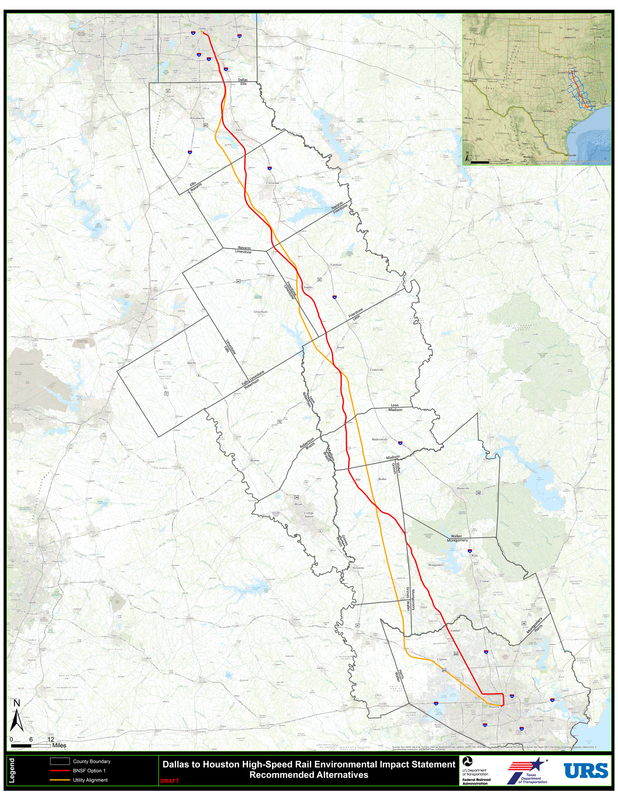 A status report on proposed lines in California, Texas, and the Northeast. A nationwide roll-out of high-speed rail may never materialize in the United States, but that hasn't stopped local plans from moving forward at their own pace. The past few weeks have brought intriguing—and in some cases, very encouraging—updates on bullet train projects in California, Texas, and the Northeast. Let's check in on the latest. When we last left California's proposed high-speed rail line from Los Angeles to San Francisco, the project had identified a much-needed long-term funding mechanism in the form of state cap-and-trade revenue. Earlier this month, project supporters got a legal boost to accompany that financial one. The state Supreme Court decided not to hear an appeal from project opponents, which means that a previous ruling, allowing construction to proceed despite claims that the project had changed too much from original voter intentions, will stand. The new decision may not end the project's legal battles, but it's a major win for high-speed rail advocates nonetheless. The line could get another victory next week if Governor Jerry Brown, one of the project's biggest supporters, wins reelection. The latest polls show Brown holding a 16-point lead over his main challenger, Neel Kashkari, who refers to the high-speed rail line as a "crazy train" and, according to the San Francisco Chronicle, has "promised to cancel it on his first day in office if he is elected." The Texas plan to build a high-speed line between Dallas and Houston using private funds has reached a new phase in its development, too. The project began holding public meetings this month to get community feedback as it prepares an environmental impact statement for federal review. It also released new documents—via a new website—showing potential routes for the line, as well as possible station locations in the two main cities. The station sites will no doubt be a major source of debate among Dallas and Houston residents in the months and years ahead. The early plans do show potential placements in downtown areas of Dallas (perhaps at Union Station in the southwest part of the city) and Houston, though there are options for stations just outside these cities, too. It's far too early to say for sure where the lines will end up, but running the train from one city center to another would reduce overall travel times, facilitate connections to local transit, and generally boost downtown areas. That should be the idea to beat. Amtrak's $151 billion vision to upgrade high-speed travel in the Northeast Corridor between Washington and Boston is no longer the only plan in town. Last week, the New York Times and other media outlets reported that a private company—backed by a number of political big shots—wants to build a maglev train in the region. The Northeast Maglev group has $5 billion in backing from the Japanese government, which wants to showcase the new technology in the United States to jumpstart an export market. The hypothetical line would surely benefit travel (the trip from New York to Washington would only take an hour, compared to nearly three on existing Acela service) and talk of private money always turns heads. But rail advocates have questioned the wisdom of starting with a short test line between Baltimore and Washington, given that maglev's major benefits over traditional high-speed rail occur at longer distances. For now, it's hard to see how a private proposal would gain momentum on Amtrak's own turf. If the idea keeps people talking about rail upgrades in the corridor, though, that's progress in its own right.